For as long as IT groups have run important applications, they’ve needed backups of their key application data. Unfortunately, many organizations are still hindered by physical backup technologies that are decades old, and waste valuable operational time, capital, and flexibility. AWS Storage Gateway offers IT organizations a seamless way to transfer backup jobs from tape or Virtual Tape Library systems to the cloud – while keeping trusted backup tools and processes in place. 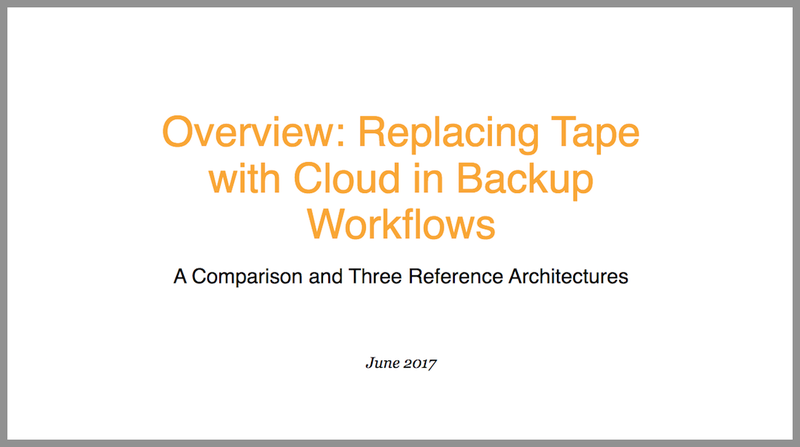 Thousands of customers have faced the tape backup challenges described above and considered what they want as they move to a cloud backup approach. Here are common reasons they choose to use the AWS Storage Gateway as their bridge from existing tape backups to cloud backup. "Tapes are a headache, prone to hardware failures, offsite storage costs, and constant maintenance needs. AWS Storage Gateway provided the most cost-effective and simple alternative. We even got disaster recovery by using a bi-coastal data center." The AWS Storage Gateway service can be configured to act as a Virtual Tape Library (VTL) that spans from your on-premises environment, where your production applications are, to the AWS cloud's highly scalable, redundant and durable storage services, Amazon S3, Amazon S3 Glacier, and Amazon S3 Glacier Deep Archive. The tape gateway presents the Storage Gateway to your existing backup application as an industry-standard iSCSI-based VTL, consisting of a virtual media changer and virtual tape drives. You can continue to use your existing backup applications and workflows while writing to a collection of virtual tapes stored on massively scalable Amazon S3. When you no longer require immediate or frequent access to data contained on a virtual tape, you can have your backup application archive it from the virtual tape library into Amazon S3 Glacier or Amazon S3 Glacier Deep Archive, further reducing storage costs. Storage Gateway is compatible with many common backup applications. The VTL interface eliminates large upfront tape automation capital expenses, multi-year maintenance contract committments, and ongoing media costs. You pay only for the amount of data you write to tape, and scale as your needs grow. The need to transport storage media to offsite facilities and handle tape media manually goes away, and your archives benefit from the design and durability of the AWS cloud platform. Want a plan? Check out AWS Project to see the steps to start using the Tape Gateway for AWS to replace tape without disrupting trusted backup processes. AWS Storage Gateway lets you easily point trusted backup software at an on-premises storage gateway that, in turn, connects to Amazon S3 and Amazon Glacier to deliver the scale and durability of the cloud for safe long-term retention, without disrupting existing investments or processes. Many customers have used the AWS Storage Gateway in a VTL configuration with major backup software tools available on the market. For a full list of supported backup products versions and media changer types, please see the User Guide. To test your VTL gateway setup with a backup product, please refer to this Documentation. Download the AWS Storage Gateway virtual machine (VM) from the AWS Management Console, and deploy it on VMware ESXi, Microsoft Hyper-V, or even in Amazon EC2 or purchase AWS Storage Gateway hardware appliance. Install the gateway and provision storage (DAS, NAS, or SAN) locally for the tape gateway. This storage will act as a durable “Upload Buffer" for data being uploaded to AWS, and as a cache for recently read virtual tape data. This Cache Storage space can be used to retain the latest backup for quick local recoveries. Configure the local gateway as a VTL using the AWS Management Console, associate its IP Address with your AWS Account and select an AWS Region for your gateway to store uploaded data. Mount the AWS Storage Gateway virtual tape drives and virtual media changer to your existing backup server and allow your backup software to discover the Virtual Tape Library and virtual tapes. Switch your backup jobs to the gateway, and data will be first written locally to the gateway, cached and buffered for upload into the VTL, which resides in S3. Much like tape automation systems, virtual tapes can be archived to Amazon S3 Glacier or Amazon S3 Glacier Deep Archive for lower-cost retention which removes them from the online VTL. Retrieve tapes from archive in Amazon S3 Glacier or Amazon S3 Glacier Deep Archive via the AWS Management Console and manage your recovery process via your backup software. You can deploy additional gateways at other sites, or in EC2 as well, both to back up data from those locations, and also for remote recoveries of your other sites. Learn more about getting started here.